Here is the Milwaukee 6390-21 7-1/4-Inch 15-Amp Tilt-Lok Circular Saw powered by a powerful 15-Amp motor that will offer users a 5800 RPM for cutting through the many job applications and material such as Microlams, wet lumber, and headers, etc. The model provides a superb visibility that delivers a very clear and extensive line of cut from both sides. Only weighing 10.4 lbs but produces 3.25 maximum horsepower offering you a terrific weight-to-power ratio. Users will enjoy the maximum comfort balance and control that the TILT-LOK adjustable cushioned handle provides reducing operator fatigue and the enhancement in job site portability to reduce downtime thanks to the handy carrying case for easy handling. See our top 10 best circular saw reviews, if this doesn’t do it for you.. My personal favorite is the Makita circular saw, I find this to be the best circular saw for both: Framers, and finish work. Q - Does the saw include a laser? Q - Is there a rip guide with the tool? A - No rip guide. Q - Does it have an electric brake? A - No electric brake. Q - Is there a detachable cord? A - No, the power cord is attached to the saw. Q - What material is the show and blade guard made of? A - The shoe is made of aluminum and the guard is made of magnesium. Q - Can you tell me the difference between the 6390-21 and the 6390-20 model? A - The 6390-21 comes with a good quality hard carrying case and the 6390-20 does not. Q - Is there a stop at 45°? A - It goes further than 45° which accommodates framers that need it to go higher. Q - Can I adjust the blade depth? A - Yes, quickly and easily using a quarter turn on the deck adjustment screw. Q - Is the saw on the left or right? A - It's on the right side. Q - Does the circular saw have bushings or bearings? A - It has ball bearings. Whether you're looking to buy your first 7-1/4-inch circular saw, or you're just eager to replace an older model that's on standby, the Milwaukee 6390-21 is worth a shot. Powered by a 15 amp, 3.25-horsepower motor, the saw will start off smoothly, it cuts evenly, and can handle nearly any material with ease. 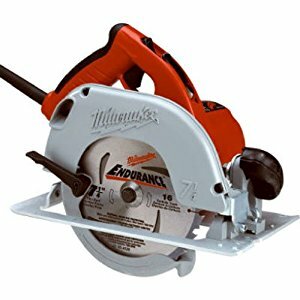 The most lightweight weight saw in its class; the Milwaukee built this circular saw with the user in mind. The Milwaukee-exclusive, eight-position Tilt-Lock handle delivers such an optimized comfort and control in a wide variety of applications. A one-touch spindle lock button will continuously make the blade changes easy for users to complete quickly. The easy-to-access depth and bevel adjustments, a full 50° bevel capacity, and a clear line of sight will ensure that each time you use saw you'll receive accurate cuts every time. Our Top Circular Saw Picks!